The article was originally published on November 30th, 2010, at 11:11 AM. It was improved, corrected and republished in May 2013. 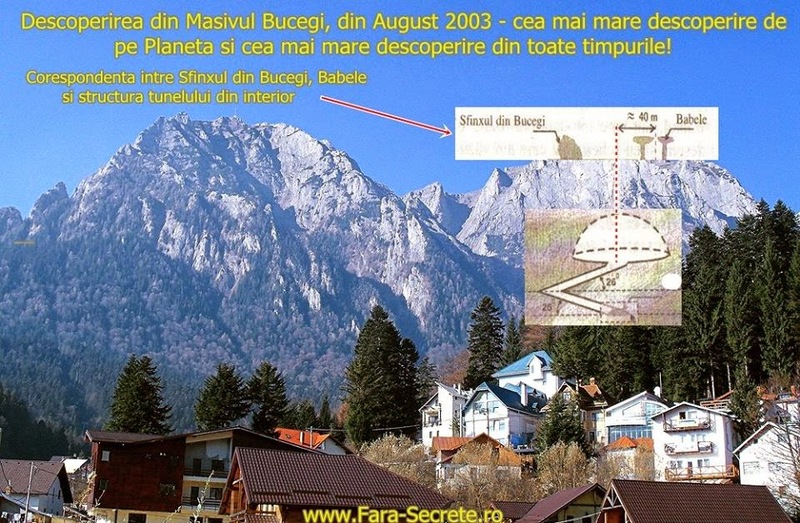 The expert on strange phenomena, and also the leader of operations for the Romanian State, Cezar Brad, is the “hero” of the shocking events that occurred in the Bucegi Mountains. He also had two memorable meetings with a leading representative of the Illuminati, and top Bilderberg member. 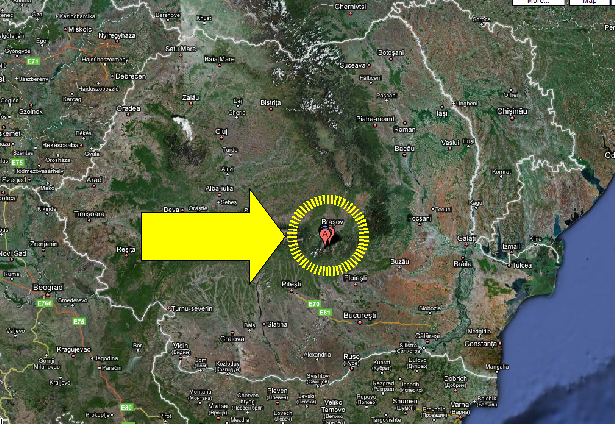 The location of the alien base inside the ‘Masivul Bucegi’ mountain, Romania. 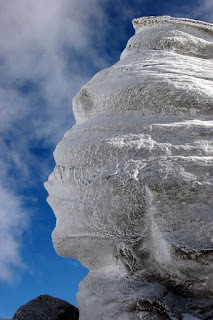 Also, notice the locations of the Sphinx of Bucegi and the Babele monoliths above the alien base. A strange visit from the Most Powerful Bilderberg Member: In May 2003, Cezar was visited by a highly important character. The meeting request came through SRI, as a result of the government’s intervention. The person was a foreigner, but spoke the Romanian language very well. He was also familiar with the country. The SRI informed Cezar that the visitor was a high ranking member of a very important Masonic lodge from Italy, he was a noble, and had very strong financial influence in Romania.His political influence was also very high, since he was able to penetrate the wall of SRI agents and reach the DZ. Cezar felt a high pressure and a heavy weight around this person. He was surrounded by a cloud of heavy, unpleasant radiation which concealed his true intentions. For this meeting, Cezar prepared thoroughly, isolating himself in a room and falling into a state of deep meditation, to learn more about the person. A SRI helicopter brought this arrogant, tall gentleman, wearing a black suit. He had a cane with ivory handle and gold inlay. His face expressed harshness and his green eyes had a strange effect, radiating unusual coldness. He presented himself as Senior Massini (probably not the real name). He was very confident of his power and created the impression of a person who was used to give orders. He was the leader of one of the most important Masonic Lodges of Europe and also to one of the most influential Masonic organizations in the world: the Bilderberg Group. Massini was very direct and stated that humans are of two kinds: those who can be manipulated and ruled (these form the majority), and those who have certain virtues and strong personalities. He said that his group is part of the highest Masonic order and is very interested in the outcome of the discussion. Mister Massini explained that the Bilderberg Group is not a Masonic lodge, and it means much more than that. He said that the lodges are just facades and the real power is much higher than the thirty-third hierarchical level. Massini invited Cezar to join the group, letting him understand that he will have many advantages. According to Cezar, Massini was both physically and psychical strong, which contrasted with his age. Unfortunately for him, his power was centered on a huge ego, arrogance and sense of superiority over the rest. Massini informed Cezar that he requested him personally, using his political influence, because he was impressed by Cezar’s psychic power. A Pentagon satellite used for geodetic espionage, based on bionic technology and shape waves, discovered in 2002 a separate unit in a specific area of the Bucegi Mountains. The empty space inside the mountain had no correspondence with the outside, and looked like it was carved from the inside, by intelligent beings. It was definitely not a cave. The satellite scan of the mountain revealed two major energetic blocks. These barriers were made of artificial energy. 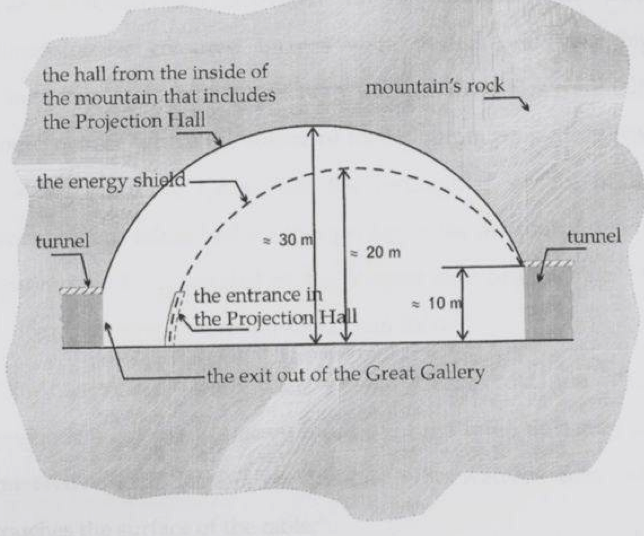 The first one was like an energetic wall, blocking the access to the tunnel, while the second one was shaped like a dome (or hemisphere), and was located at the opposite end of the tunnel, near the center of the mountain. Massini was sure that inside the dome they will discover something extremely important. He had deep knowledge about the origin of this discovery and had knew of the existence of at least one item located inside the great hemispherical hall. 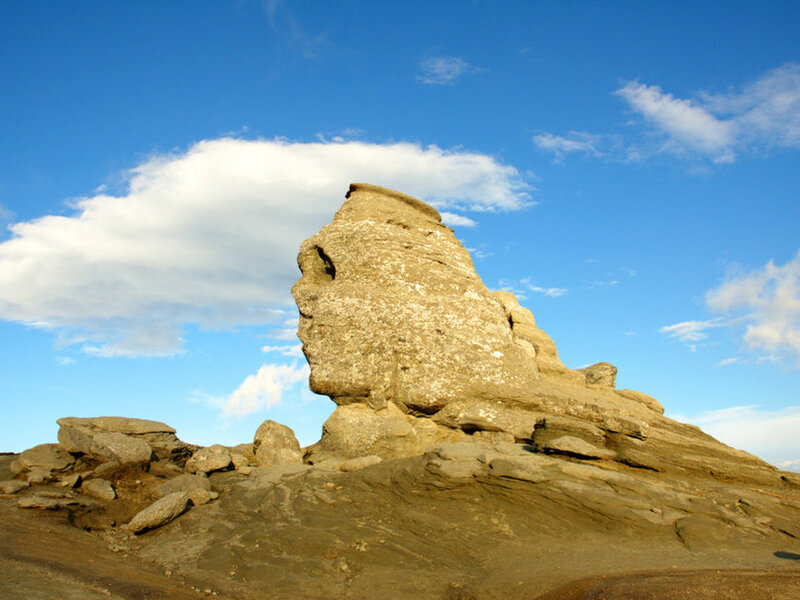 The tunnel and dome were strangely aligned with the rock formations from the top of the mountain, known as “Babele” and the “Sphinx of Bucegi”. 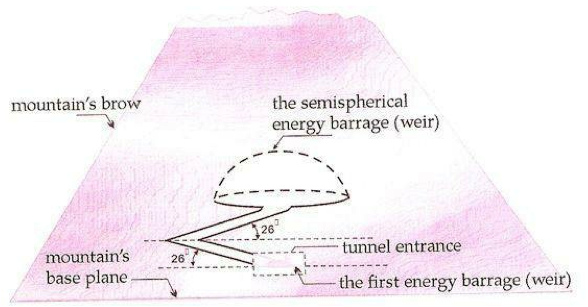 The Pentagon team noted that the hemispherical energy barrier had the same vibrational frequency and the same shape as one other top secret underground structure that they had discovered prior, near Baghdad, Iraq. Shortly after this discovery, the Iraqi war broke out and after a few months, the Americans had access to the biggest secret in the area — which the Iraqis knew nothing of. Massini explained Cezar that the content of that discovery had to do with Earth’s mysterious past and the history of their secret organizations. When the Pentagon investigation noted the similarities between the underground structure of Baghdad and the one from the Bucegi Mountains, Massini and his masonic lodge became extremely agitated. Initially, they’ve almost panicked. The panic was due to the fact that this structure – much larger and more complex than the one from Iraq – is on Romania’s territory. [Apparently, Romania is probable to play an important role in the downfall of the secret societies that control the world and enslave mankind. 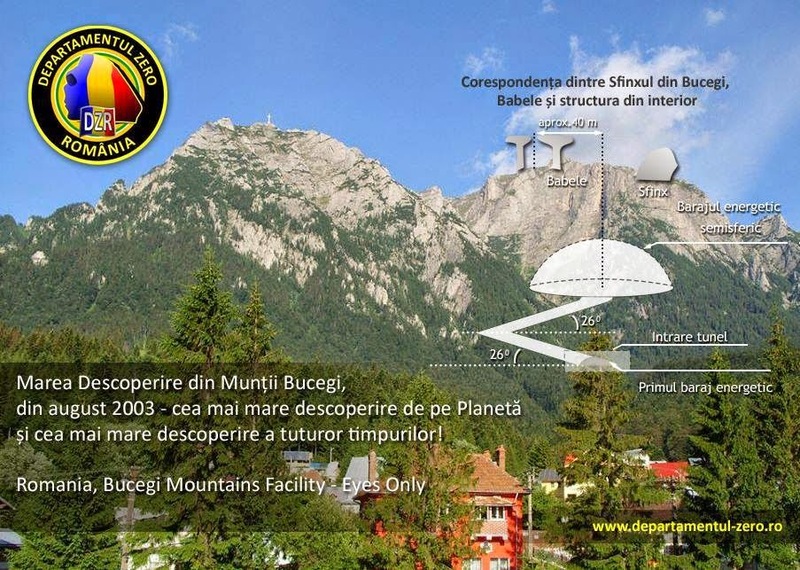 It was also suggested that somewhere above the Bucegi Mountains, an energetic pyramid is located, which is invisible to the naked eye, and contains the real history of our planet. One can imagine their panic]. Massini brought to the drilling site an ultra sophisticated, hard rock drilling machine, used by the US military. The device used a strong plasma jet and a sort of rotating magnetic field, literally melting the rock with no visible effort. They were able to achieve penetration about 60-70 meters away from the first energetic barrier, and reached the first gallery, which looked like a subway tunnel. Its walls were perfectly polished. At the end of the tunnel there was a massive stone gate, which was protected by an invisible energetic barrier. Three members of the first special intervention team tried to touch the door, and immediately died of cardiac arrest. Any object (rock, plastic, metal or wood) threw at the barrier, immediately turned into fine dust. Two generals from the Pentagon and the U.S. presidential adviser arrived on the spot. Beyond the formidable energy barrier, which caused the deaths of three people, there was also the solid rock gate. On the tunnel’s wall, just in front of the gate, there was an area of 20 square cm, on which there was precisely drawn an equilateral triangle pointing up. The square was located between the huge grinding stone gate and the invisible energy barrier. Cezar felt that there is some kind of compatibility between the energetic barrier and himself, something like a mutual “sympathy”. His hand lightly touched the surface of the energetic barrier and he felt a tingling on the skin. The shield was completely harmless to him, so he stepped forward, passing right through it. The U.S. officials were absolutely stunned. Cezar estimated the barrier to be no more than an inch thick. He touched the triangle drawing located in the center of the square, and the gigantic stone door silently slid to the left, into the wall. That command also cancelled the energetic barrier, giving them access to a huge room, which was later named “The Grand Gallery”. Even though there was no visible light source, the Grand Gallery was perfectly lit. After turning off the first energetic barrier, the huge hemispherical shield at the other end of the room, suddenly tuned to a higher vibration and started emitting higher radiations. On a closer analysis, the wall inside the Grand Gallery seemed synthetic but also felt like something organic was part of it. It had the color of oil, but the reflections were green and blue. Later tests revealed that the wall’s material was somewhat rough to the touch, but it could not be scratched or bent. It withstood any attempt of breaking, piercing or cutting it. Later, the scientists tried to burn the material, but in a mysterious way, the flames were somehow absorbed within it, leaving it untouched. The American scientists agreed that the material is a mysterious combination of organic and inorganic matter. After 280 feet, the gallery suddenly turned to the right in a sharp angle. Further ahead a blue, sparkly, light could be seen. The blue light at the end of the gallery was the reflection of the protective shield of energy. The U.S. adviser on national security issues received a call and he was notified that the energetic shield from Baghdad, Iraq, had been suddenly activated, and it was also pulsating at a higher frequency. In front of the shield from Baghdad, a hologram of our planet appeared, which sequentially and progressively depicted the European Continent, then moved to the south-east, then it showed the Bucegi Mountains from Romania and, finally, it showed their own location within the structure’s corridor. It was obvious that the two hemispherical energy shields were in a direct connection. Basically, the Iraqi base had been notified about the presence of people inside the Romanian base. The bad news was that the U.S. presidency was notified and it contacted the Romanian diplomacy. In just a few minutes, the whole operation had been disclosed, and Lord Massini’s plan went down the drain. The U.S. presidency demanded to take control over the secret base and the entire operation. The Romanian politicians, who knew nothing of the undergoing secret operation, panicked. The Pentagon’s generals present at the scene, had been informed that Washington demanded an urgent meeting. An emergency session of the Supreme Defense Council (CSAT) had created a huge wave of sympathy for the Zero Department. Most were shaken by the news they’ve received. The CSAT’s decision was to continue the research, but under Zero Department’s complete control. They’ve had also demanded an inventory of everything found in the Great Room. From Bucharest (Romania’s capital), the orders came in waves, canceling each other. Some were very vehement and strict, while others were elusive — denoting the huge tension. CSAT’s members were in continuous session, keeping in touch with the Bucegi Mountains team. After discussing everything for hours, they had decided to make the discovery public. The Romanian government was to make a formal statement to the entire world. Some CSAT members vehemently opposed the decision. When the U.S. diplomacy had been informed that Romania will disclose the discoveries, everything tuned into chaos. The President was called for a direct phone conversation with the White House. Within hours, the U.S. blocked all financial transactions with Romania and its access to all other financial institutions. 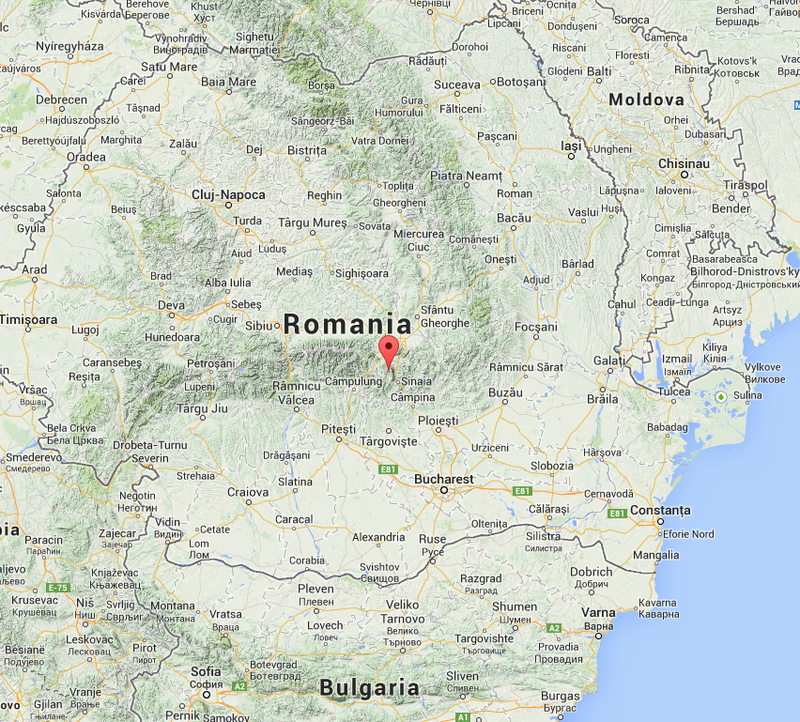 Romania was about to declare “State of emergency” in the Bucegi Mountains and the capital. The talks between the U.S. officials arrived in Bucharest and the Romanian Emergency Department took place without a translator. The U.S. officials were verbally violent, constantly shouting and uttering threats to Romania and its officials. Romania’s official disclosure to the world would have provided photographic evidence and anything else essential for a complete clarification. Leading scientists and researchers from all over the planet were to be invited for in depth studies. But most importantly, it would have revealed the truth about mankind’s distant past and the real history — which according to what Cezar witnessed inside the Grand Gallery, is almost entirely counterfeit. The reaction of the U.S. government was so brutal because that disclosure would have shattered their global influence and power, in a instant. The official reason cited by the U.S., was not to create panic in the world, but they had omitted to acknowledge that the current state of global anguish is a direct result of deliberate deceit and manipulation conducted by the Freemasonry and other secret societies, for millenia. There was also an intervention from the Vatican (if you wonder how did the Vatican found out about this discovery, then you should know that they are at the very top of the world’s control pyramid, and their religious piety is merely a facade — read: The Darkest Secrets of the Vatican), in which the Pope (!) called for moderation before this great, fundamental, step for mankind. The Pope promised to make certain documents available to the Romanian state from the ancient papal secret archives, which were of great importance for Romania. The documents were backing up the discoveries (yes, that’s how powerful a Pope is). After 24 hours of negotiations, a final agreement occurred between Romania and the USA. The Romanian state was to postpone the disclosure, and gradually present everything to the people. The Grand Gallery ended abruptly with a giant auditorium, 30 meters in height (98,5 feet) and a length of 100 meters (328 feet). The Projection Room was smaller in size and it was protected by an energetic shield. Advancing towards the shield, a portion of it disappeared, in the shape of a door, allowing access inside it. The shield protected the room by any outside influences. Once inside the room, the shield became compact and looked like a white-golden wall. Basically, the shield formed this dome-shaped room, with curved walls and ceiling. At the back of the room, at a height of a about 10-12 meters (33-39,5 feet), the shield ended where it touched the room’s stone wall. In this wall there were three enormous tunnel holes: one located straight ahead, and the other two were symmetrical on both sides. They were lit by a diffuse light in a greenish tint. Both sides decided to prohibit the access to these tunnels and a protocol was signed between them. A series of huge stone tables were arranged along the right and left walls (five on each side), following their curvature. The tables were about 2 meters in height (6,6 feet).The table tops had precision cut-in reliefs, different signs of an unknown writing and characters that resembled ancient cuneiform. The writing also contained more general symbols, such as triangles and circles. Although the signs were not painted, they’ve had a fluorescent light radiating in various colors, different for each table. On some of the tables there were different objects, which appeared to be technical tools. From many of these tools, translucent-white wires descended to the floor, and entered inside shiny, silver-like, rectangular boxes. These boxes were placed directly on the floor. At a closer inspection, the cables were extremely flexible and lightweight, and light pulses could be seen circulating along their length. Each time someone approached the tables, a holographic projection was automatically activated, presenting aspects of a particular scientific field. The three dimensional images were perfect and had height of almost two and a half meters (8,2 ft). The projections were automated and ran by themselves, but at the same time they were interactive, and changed according to the signs touched on the tables’ surface. Because of the great height of the tables, the scientists used special tripods to climb at a comfortable height. At a closer investigation they’ve observed a dark-glassy material covering the table tops. The material was divided into several large squares, bounded by straight lines, which formed some kind of a grid. One of the tables contained information from the field of biology, and it projected images of plants and animals, some of which were completely unknown to the scientists. After touching one of the squares, a hologram presenting the structure of the human body was activated. The hologram was constantly rotating, highlighting various areas of the human body. Touching other squares activated holographic projections of extraterrestrial beings, from other planetary systems. Simultaneously touching two different squares, a complex scientific analysis was projected, showing the DNA of both species, and compatibility possibilities between the two. On the sides, in vertical lines, there were written explanations in the same, alien alphabet. At the end of the simulation, a crossbreed between the two species was displayed. 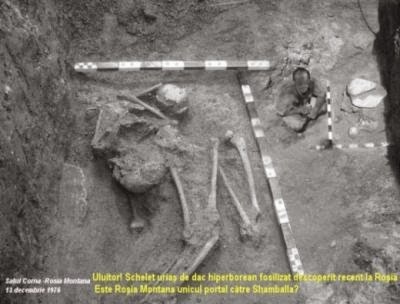 “The team from the newspaper is accompanied by researcher Vasile Rudan, who noted that the people of the Bozioru village have concrete evidence: a cemetery with skeletons of giants. It was discovered by chance over 20 years ago, when the authorities decided to plant apple trees in the village of Scaieni. Digging on a hill, the villagers discovered huge skeletons, measuring more than 2,40 m (7 ft 10 in). The Projection Room contained detailed information from fields like: physics, cosmology, astronomy, architecture, technology, biology, genetics, and even religion. Because it contained so much information, the room was compared to a library. In the middle of the room, there was a podium-like area which contained an interesting device. The scientists speculated that it might have been a device to enhance various cerebral functions. Next to it there was a command panel, covered with various geometric symbols, in different colors. There were also two sliding levers and a red button, in the center of the panel, above all other commands. 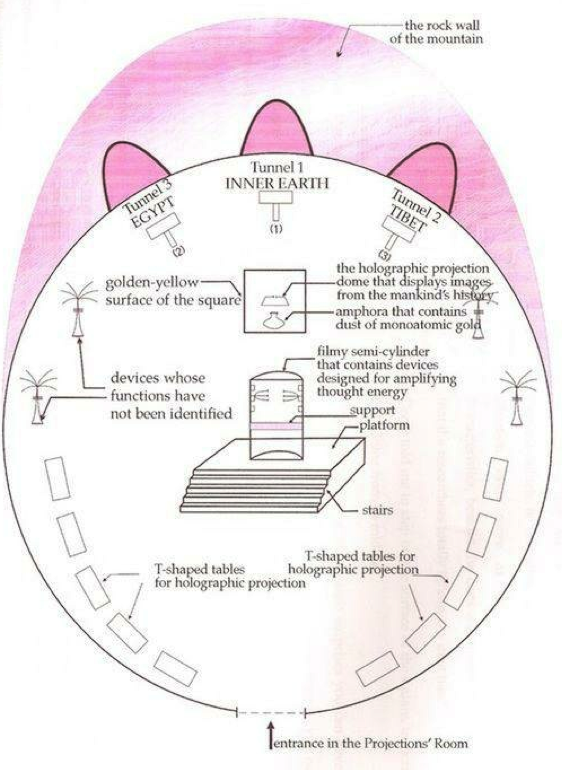 A holographic simulation explained the purpose of the button. It showed an image of the Carpathian Mountains as seen from 25 km (15,5 miles) above them and next, an enormous quantity of water flooded the lowlands and plains. Next, from the territories of Romania, Hungary and Ukraine, more streams of water appear, heading towards the Transylvanian plateau, in the form of huge rivers. The image focused on Romania’s territory and showed most of its surface covered by the waters of a great sea. Some of the tallest mountain peaks could now be seen as small, floating islands. Next, the waters begun to withdraw, as soon as the leavers found on the panel were activated, leaving sunk only a small area near the Retezat Godeanu mountain. A true manual. Behind the control panel there was a square pedestal, of about three meters (9 ft 10 in) per side, on which a mysterious amphora was resting. Lord Massini had knowledge of its existence and, for him and his Masonic elite, this was the most important discovery. The amphora contained a very fine white powder. The researchers were dismayed to find that the powder was a high purity formula of monatomic gold, with an unknown crystalline structure. The gold powder in its pure form greatly stimulates certain waves and energy exchanges at cellular and neural level. This causes an accelerated process of rejuvenation. Theoretically, a man can live in the same physical body for several thousand years, provided they consume from time to time, a well-defined quantity of monatomic gold powder. This explains many puzzling aspects about the incredible longevity of some important figures and uncovers part of the hidden intentions of the global elite. Behind the amphora, in the middle of the square, there was a huge dome that projected holograms. It displayed the main aspects of humanity’s most distant past, from its very beginning. Cezar explained that according to the images projected by the hologram, about 90% of mankind’s official history is false and counterfeit. Darwin’s evolutionary theory is also incorrect. In the middle of the square is a huge dome which projects a hologram of moving parts. It contains the main aspects of the very distant past of humanity, from its very beginning. Cezar explained that according to the images projected by the hologram, Darwin’s evolutionary theory is completely false. The true origin of man is depicted in a condensed holographic form. After these lessons of truth, we can say that 90% of the official history of mankind is false and counterfeit. Unbelievable, but what is now considered to have really happened in our history, never did, while the so called “myths” and “legends” are almost entirely true. Also, most archaeological theories are false. For example, the dinosaurs did not went extinct 65 million years ago, and the old continents of Lemuria and Atlantis existed. This strange inversion caused many problems and conflicts between people in our past. For a correct dating of the presented events, a star map corresponding to that period was projected on the background. Although the time period covered by the projections was very large (several hundred thousand years), and the procession cycle of the Earth is 25,920 years, by observing the number of “Platonic years” (the 25,920-year cycle) the exact dating of the events was possible. 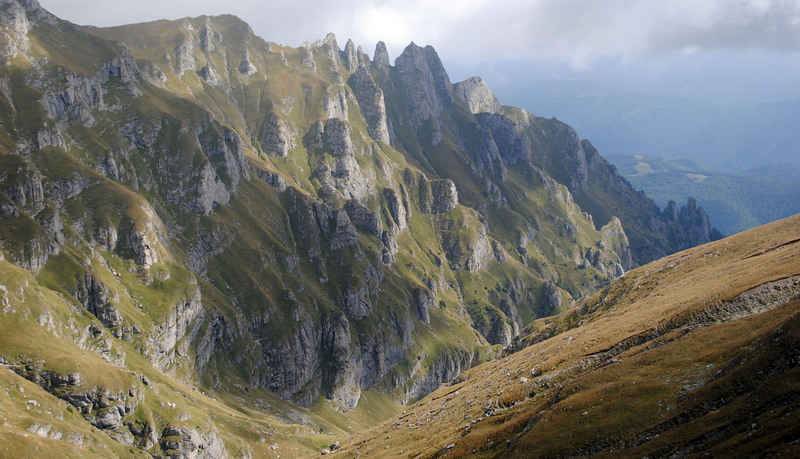 The Bucegi Mountains are 50-55 thousand years old. Cezar saw what happened during the so called Great Flood and where the human civilization originated, but he decided not to reveal this, as the revelations are too shocking for the mentality, ideas and knowledge of the contemporary man. Personally, I think people like him are also responsible for the current state of unawareness and latency of the human species. We have been lied and manipulated for millenia, and as soon as we are close to the truth, someone decides that we are not yet ready to hear it. This is an arrogant and selfish approach! The people are as ready today as they will ever be, and the sooner the truth will be released, the better. Having more pieces of the puzzle will make them accept the truth easier and, more importantly, will make convince them to take action against the manipulators and enslavers. In a disturbing display of images, the existence of Jesus and his crucifixion was also presented. The projections revealed that many of those who witnessed the crucifixion came there from other historical periods. They were wearing the same kind of clothing as the rest of the people, but their facial features were different, hence they were constantly covering their faces. The hologram also presented fragments from the spiritual lives of other exceptional characters of mankind’s distant past, including people that we know nothing of. In those times, the social and population distribution were completely different from what is known today, so the archaeologists and anthropologists should review their theories from scratch. The discovered tunnels are thousands of miles in length and lead to three different areas of the planet. The one in the left connected the Romanian base to a yet to be discovered underground base somewhere in Egypt (which was definitely discovered and explored by now). 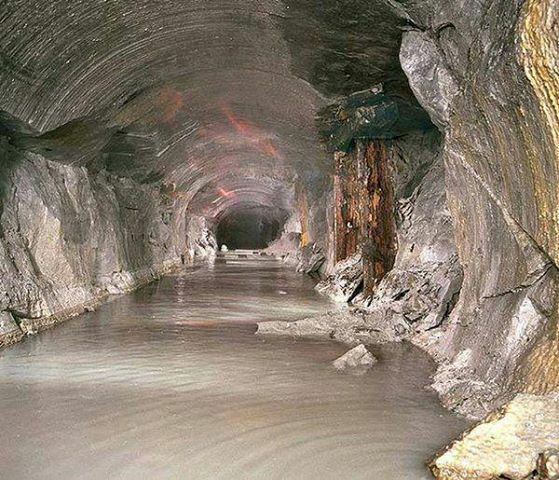 Intense preparations begun for expeditions inside all 3 tunnels, as following: the first one to Egypt, the second to Tibet, and the third one to Earth’s core.